EPA PRESENTS DIRECTV WITH ITS HIGHEST ENERGY STAR HONOR! NEW! EPA PRESENTS DIRECTV WITH ITS HIGHEST ENERGY STAR HONOR! The latest award is DIRECTV’s sixth consecutive ENERGY STAR Honor and makes DIRECTV the only TV Provider to receive the prestigious Sustained Excellence Award. The U.S. Environmental Protection Agency (EPA) has recognized DIRECTV with a 2015 ENERGY STAR Partner of the Year – Sustained Excellence Award for its outstanding leadership in protecting the environment through superior energy efficiency achievements. 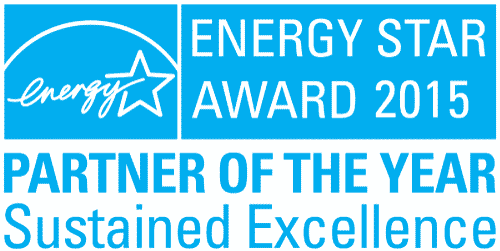 An ENERGY STAR partner since 2009, DIRECTV will be honored for its long-term commitment to energy efficiency in Washington, D.C. on April 20, 2015. DIRECTV earned its EPA award for consistently delivering the most efficient set-top boxes to its customers, educating consumers on whole-home solutions, and developing innovative partnerships with utility companies to upgrade older receivers to more efficient models. In the U.S., DIRECTV reached a major milestone last year. For the first time since 2010, all new receivers purchased in 2014 were ENERGY STAR certified. DIRECTV customers have saved billions of kilowatt-hours of electricity and hundreds of millions of dollars since 2009. The total energy consumption of all active deployed receivers is down 8 percent since 2012. DIRECTV has maintained its strong commitment to ENERGY STAR by deploying nearly 12 million certified set-top boxes (receivers) with more than 65 million ENERGY STAR certified receivers deployed since joining the program. DIRECTV has seen incredible market uptake for its efficient Genie® whole-home HD DVR solution. With the Genie, a customer’s home has one central ENERGY STAR certified DVR (an HR44) that connects to ENERGY STAR certified Genie® Mini or DIRECTV Ready (RVU-capable) televisions with no additional receiver required other than the Genie. This solution reduces energy consumption by more than 40 percent relative to the ENERGY STAR certified three-room Whole-Home architecture DIRECTV offered just a few years ago. As a Partner of the Year, DIRECTV has continued to promote this program to our stakeholders with a Public Service Announcement that has played almost 8,000 times on national TV channels such as CNN, Discovery, and HGTV. The 2015 Partner of the Year – Sustained Excellence Awards are given to a variety of organizations to recognize their contributions to reducing greenhouse gas emissions through superior energy efficiency achievements. These winners have reduced greenhouse gas emissions by setting and achieving aggressive goals, and employing innovative energy efficiency approaches. These awards recognize ongoing leadership across the ENERGY STAR program, including energy-efficient products, services, new homes, and buildings in the commercial, industrial, and public sectors.